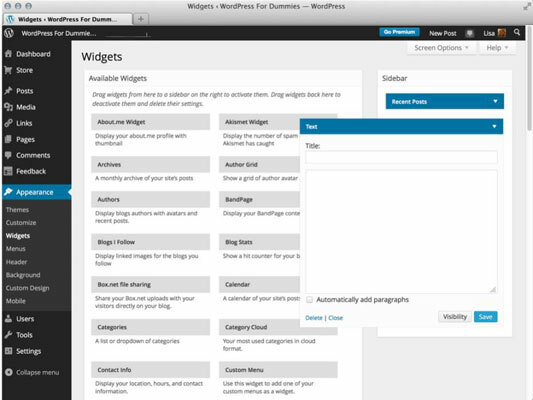 The Text widget in WordPress.com is a little different from the rest of the widgets on the Widgets page. Add the Text widget just as you would any other. After you have it settled in the sidebar, click the arrow to the right of the widget title. A text box drops down to let you type text or HTML code to insert a hyperlink or include an image file. Type a short paragraph of text, such as a bio. Insert the HTML code to display an image in your sidebar. The Text widget accepts basic HTML that you can use to do things like insert an image, a hyperlink, or a list of items. You may need to brush up on some HTML markup to make that happen.